With her sleek design, the Radiance class ships are the latest generation of world cruise ships to enter the Royal Caribbean fleet. Offering the ultimate "at sea" experience, combining speed, added comforts, greater space, sweeping ocean vistas and an enhanced staff committed to serving your every whim. The most striking feature of the Brilliance is its generous space/pax ratio. For all the passengers these ships are surprisingly uncluttered and roomy. The existing three Radiance class ships are like water drops, but there are some minor differences. I visited the second and third ships in the series, the Brilliance in Barcelona and the Serenade in Amsterdam. Harri Kulovaara, senior vice president of marine operations, says that "The changes in this ship are tweakings; we were learning from the Radiance. We are continuing to open up the ships with extensive glass, and on the Brilliance we doubled the amount from the Vision class to three acres. The Centrum (on both ships) has a different twist on the glass elevators. They face outward, and the coffee shop was moved to the Centrum, a better focal point. Public room decor is changed but we used the same designers. Plus, a boardroom was added." Among her spectacular features are the 10 deck glass constructed Centrum, with glass elevators facing the sea, and the highest percentage of outside cabins in the Royal Caribbean fleet. The extensive use of glass throughout (half the ship's exterior is glass and floor to ceiling windows are featured in 16 public areas) means an "at sea" feel and an atmosphere of calm and relaxation on board. These ships will appeal to a variety of age groups, with active baby boomers and children leading the pack. Also, there are a lot of children on board, an estimated 250 kids per sailing. As always on a Royal Caribbean cruise, you have the choice of dining experiences to suit you, in addition to the spectacular main dining room. From the informality of the Seaview Cafe close to the pool, to the upmarket dining experience of Chops Grille or the Italian themed Portofino restaurant, as well as the 24-hour room service which offers the same variety of choice as the main dining room. 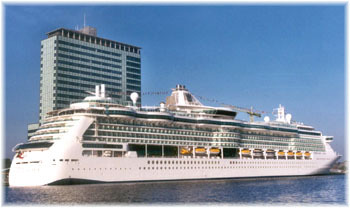 The Radiance-class ships of Royal Caribbean include four vessels, all built in Meyer Werft, Papenburg, Germany: Radiance of the Seas entered service in March, 2001 and was well received throughout the industry, followed by Brilliance of the Seas in July, 2002. Serenade of the Seas in August, 2003, and Jewel of the Seas, which is scheduled for the summer of 2004. I read some reports that write about these ships in terms of "yacht like ambience". I think that this isn't true: the RCI Radiance class are big vessels. In total, there are 15 decks. They have a size between the big behemoths of the Voyager class, and smaller (but also big), sleek, and sophisticated vessels of the Vision and Sovereign classes. But don't forget that you will share your cruise with another two thousand people. In fact; this class is a fusion of the two, and very much on par with the vessels of the premium brand Celebrity Cruises. Radiance class ships have a dozen or so big public rooms, but one feature I love is the variety of small, intimate spots with leather sofas and chairs scattered throughout the vessel. My favourite design feature is the diverse atmosphere of lounges and clubs, ranging from an ultra modern champagne bar overlooking the sea to the very clubby, aristocratic Colony Club, offering the first pool tables at sea. These ships offer a modern design, which works well and gifts her guests with the eye details they have come to expect: hand crafted balustrades, wood panelling on every deck, exotic themed solariums, a lot of well chosen art works, cascading waterfalls, etc. But also I think these ships, as well the whole fleet of contemporary built cruise vessels, feature too much a "resort" character. As a consequence, the Radiance class works as floating hotels, in which the passengers seem to naturally gather in the lobby bar and the atmosphere, is lively and upbeat. You won't be disappointed in the range of entertainment: there is more to do than you'll have time for in a one week cruise. And while the ship's primary features are pleasing to adults, there are extensive separate facilities for kids and teens. I think the most beautiful decorated rooms are found on deck 6. Schooners Bar is thoroughly nautical, with dark panelling and blue carpet. Adjacent is the Colony Club, an enormous low-key nightclub resembling a private British club like you'd find in Asia. All public areas are located on two inside decks and two outside decks. This fact certainly helps with passenger orientation. The signposting is commendable and the design of the atrium adds to this positive feeling. The focal point, the real soul of the ship is the Centrum, which extends over eleven decks. In addition to the reception the different decks accommodate two bars, the library, twelve Internet stations and several small lounges. The individual decks are served by six panoramic elevators, four of them facing the sea. This space is a light filled area and is one of the most visually exciting atrium I've ever seen. The Centrum on RCI has an open philosophy, plenty of glass and, as a consequence, plenty of light. It looks airy and roomy, and feels bigger than it really is. Also, each passenger deck above has glass and stainless steel railings and balconies that permit you always to keep tabs on the action below. This open plan is far from other atrium philosophy, such as the Carnival Destiny class ships, where the atrium's lack of open railing on upper decks, and also the atrium size bring down the higher decks. I haven't a fear of heights, and it is always a comfortable experience for me to see the Centrum bottom from the highest deck, checking out the action below. I can't imagine a better ship to take to any scenic location, due to the lavish expanses of glass. The starboard side of the upper decks is a big screen, where at night time the central sculpture reflects some lighting ambiences. I think, on the Serenade of the Seas, that these big works of art, which have a "C" form hanging from stainless steel cables, with blue and green net adornments, are poor and become unworthy of the praise for the whole atrium. The Spiral Light of the Brilliance, a magnificent stainless steel piece of art, looks far better in my opinion. Royal Caribbean has created an enormous glass panel on the port side rising from deck 5 to 12, so wide expanses of sea and sky are always visible. The ship's elevator block is glass made, and your view is either the ocean or the enormous atrium. This also has some nautical flavour because the elevator doors feature old coast maps and look opulent with the marble floor and wood panelling. The signposting here is excellent: a ship model, located up an elliptical table (which is also up an elliptical multicolour floor) is located in the centre of the elevator block, and gives help for easy orientation. The lobby bar is located in the lower atrium deck forward. This also features an elliptical marble made counter, and has a wood, stainless steel and canvas ceiling. The centre of this lower deck has a marble floor in the form of a compass card, and elliptical tables and green and blue sofas. There is also a small stage where a pianist plays each night. Natural plants and a small water fall arranged around the central opening of the main stairs, complete the decoration. This space is always packed, mainly at night, because passengers use it as a meeting point before dinner. Also is located here the purser's desk on the starboard side, and some pc's forward on port side. The upper levels of the atrium house a number of interesting smaller rooms. A splendid glass made round stair connect the lower deck with the Latte-tudes Coffee Bar on deck 5. On Carnival Spirit class cruise ships, this same glass stair is located between the two upper levels of the atrium. Some people finish their cruise and never see it. The low RCI location is, undoubtedly, the better to show it. Latte-tudes is a place to relax with a coffee, view the sea, or "sailing" the Internet (a true Internet café experience!). A deck above, in the starboard side, is located the low key Champagne Bar, with views of the atrium and floor to ceiling windows on the sea side. It has two levels to improve sea views. It's decorated in blue and pastel tones, and features an elliptical counter in the centre, made in light wood and with a marble top, which show several sizes of champagne bottles. The comfortable sofas feature brown and blue upholstery and the tables are also elliptical. A small but well-stocked library also faces the atrium on deck 9. It lacks height and also shares the noise of the atrium. The floor here has been expanded towards the atrium, to accommodate several tables and chairs, with brown leather upholstery. The book shelves are made in light wood and glass. I think this is not a good area to locate the library. There is also a business centre and a Concierge Lounge for suite passengers. 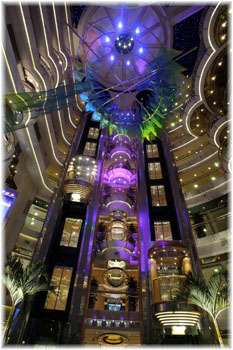 Crowning the atrium, on deck 12, is located the tiny Crown and Anchor Club, where RCI directly sell cruises. The decoration is a mix of classic and nautical flavour: dark woods, ship models, leather sofas and chairs. But the most impressive feature is a stunning view of the entire atrium beneath your feet through a glass platform located in her centre. 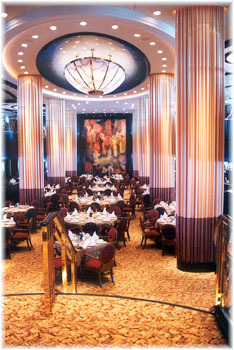 The two-level main dining room, located on decks four and five amidships, just aft the atrium, provides seating for a total of 1,229 passengers, and works in two sittings. This space is stately and refined, with a grand staircase and ten massive pillars draped in gold and red fabric, which add a further elegant touch. It is clearly influenced in the main restaurant design of the Celebrity fleet: its location aft, the big pillars, the staircase, etc. Mahogany walls, also mahogany beams in the ceiling and pillars, the brown fabrics, curtains and upholstery make this restaurant elegant indeed. It's also interesting to see the two different environments in this room: on deck five, there are huge windows, with magnificent views and a cheerful atmosphere. But on deck four, big portholes give a more intimate atmosphere. The room is absolutely vibration free, but is noisy in the two deck high centre, below the big golden lighting device. The ceiling is painted imitating a blue sky, plenty of stars. The draperies around the pillars help to reduce this problem. Aft, there is a big painting called Gala Suite, make by Frank Troia, on Serenade, which adds colour to the room, but I prefer the aft well and huge windows found in the Celebrity ships. The chairs are comfortable, and the passenger can choose to have dinner in tables of various size and forms. But I think the tables, in several zones, are quite close together. A curved staircase connects the two levels, although you can also enter each level on its respective deck. Also, there is a small stage at the top of the staircase, up a cascading waterfall, where a pianist plays during the evening dining hours. I was pleasantly surprised at the high quality of cuisine served aboard Brilliance and Serenade, especially since I took the first cruises. I enjoyed mainly the pastries, one of the tastiest desserts I've had on any ship. There are two small dining rooms in the lower level, located both sides forward, perfect for private parties. Forward of the Centrum on deck 5 is a shopping mall, which comprises several small shops arranged on both sides of a tortuous marble decked passageway. There is a perfume shop, a souvenir shop, a RCI shop, a general store, a jeweller's and a gift shop. All shops have their own design and decoration, and have higher quality merchandise than you'll find on other RCI ships, including designer wear and bags and a wonderful jewellery store. Beyond the shopping area is found the photo and art gallery. Several thousand photos are displayed for sale, on an area of more than 120 square meters. The wooden made photo displays stands can be folded away during off time and they also show a splendid classic photo collection. The photo shop is also extensive. The three meeting rooms are located in this area. Two of them can be joined. They have the most advanced technical devices, but the chairs aren't comfortable. The brown carpet and wood panelling made these spaces a bit dark. These rooms are near to the small cinema and the big theatre. This group of spaces can work together if the convention needs a multiple room arrangement. On decks four, five and six, there is the main theatre, with seating for approximately 900 guests. It's called Pacifica on Brilliance and Tropical on Serenade. Broadway-style shows are performed here. The access to this huge space is through two magnificent passageways on deck 4 and 5. The deco is superb: on Serenade of the Seas, there are hand carved and stained glass panels, with butterfly motifs, whereas the splendid Pacifica Theater on Brilliance has a volcanic motif and the entrance are lined with red lava lamps. The decoration is done mainly in green (upholsteries and lateral walls), whereas the tapestry is blue. The seats are comfortable, but the there is a lack of tables. There is a small bar aft, with a dark wooden counter. Both sides the wall is green, with vegetal decoration, and indirect lighting. The huge theatre seats have excellent sightlines (only eight tiny pillars which don't block the view), with sloping floor, and an amphitheatre seating arrangement also with a pronounced incline. The ceiling is formed by curved surfaces in the center of the room, whereas the perimeter is painted in blue. I think the decoration is plain, mainly the ceiling, but the sound and lighting equipment is striking. On deck 6, you leave the ultra modern decorated Centrum and access aft starboard into Schooner Bar; the signature bar found on all RCI ships, through a wide corridor which has plenty of nautical antiques and old harbour reproductions, with a wooden frame of a ship's hull in the ceiling. The Schooner Bar on board Radiance class ships is larger (and more crowded) than on the other RCI ships. But I think this fact is due first because of it's success, and also due to the fact that it is out of the passenger circulation. Any passenger who wishes to go to the alternative restaurants or to the Colony Club must pass through Schooner, and cannot avoid it. As a consequence, this design converts this splendid space into a bottle neck. The Schooner area itself has also a nautical flavour. There are a lot of nautical memorabilia, ropes, canvas, barrels, large sailing ships displayed in glass cases, and a splendid navy blue tapestry. Seating arrangements are comfortable, all with leather upholstery, and circular and elliptical tables, some of them with a compass card. The bar has a wooden made elliptical counter, and is located in front of a large figurehead. Another wooden frame is found above this bar. And the pianist plays aft under canvas and masts. The two alternative restaurants are directly accessed from Schooner, which acts also as meeting point. However I think it is too small, and the two bartenders aren't able to cope with all guests demands and it is very difficult to find a free table. The next room aft is the Colony Club, a splendid space with several ambiences, all of oriental flavour. It works as a secondary lounge, larger than 1,000m_, which seats about 400 passengers. It's a dark environment, decorated in blue, burgundy and gold. A multitude of activities take place in the Colony Club during the day, such as bingo, dance classes, fitness, and at night, a quartet plays delicious music, in a quiet environment. The first room found the Bombay Billiard Club, equipped with two self-adjusting billiard tables, a first in the industry. I enjoyed here the wooden floor and the oriental carpets and furniture found opposite the billiard tables. Aft starboard there is a bar, on a raised section overlooking the large dance floor, with some high tables with built in chess pieces. The main lounge area, which has a large dance floor and stage, is somewhat sunken. The small stage is located port side, between two elephant heads. The dance floor is wooden, and is surrounded with a lot a chairs, some of them upholstered in red, some in zebra skin; comfortable leather sofas and classical dark wood tables. The raised aft section has also a sunken bar, and comfortable seats to enjoy the ship's wake through large windows. The last room of this space is the card room, located aft port side, with classic furniture. The two alternative restaurants, the Grill and Portofino (both with a $20 surcharge), are located next to each other on the port side of deck 6, close to Schooner Bar. Both are classy, intimate, and elegant and offer a very special dining experience, with lot of waiters to give the finest service, with reservations required. Comfortable chairs, fine silverware, the better wine�a true gourmet experience. Portofino restaurant serves upscale Italian food, seats 112 passengers and is decorated in light wood, with a fresh and airy ambience. The Grill steak houses 95 guests and is darker than Portofino, with more wood panelling. I enjoyed mainly the open galley, and the excellent service. Both restaurants have floor to ceiling windows on the port side with splendid views. Forward of the Centrum is found the Casino Royal, with more than 200 slot machines and tables for black jack, craps, and roulette. Is the most heavily decorated space on board, with blue tapestry and upholsteries, forged iron hand rail, stained glass panels, mosaic floors fitted in tiling designed with stones, and coloured mirrors and ceilings. A circular bar is located in the centre of the room. I did not like the casino's design: the mix of too much lighting, reflecting surfaces and screens did nothing for my eyes. But it is not possible to avoid this on most cruise ships. On Radiance class, if you like to go from Schooner forward on deck 6, you must pass through the casino. Forward sports fans will love Scoreboard, the sport bar on board, where you can watch live sports events displayed on the large LCD screens. The decoration here is energetic and futuristic, with a lot of stainless steel, blue and red upholstery and a circular counter. There are several sports memorabilia displayed is glass cases. There is also a green decorated cinema with two movies per day. The two deck high cinema has seats for 64 passengers, and also has an extreme slope�It is impossible to see the head of the passenger seat in the next row! It has a port-starboard lay out, and is equipped with a 5m by 3.65m large screen starboard and the latest projection devices, has a curved ceiling, and like the theatre, has halogen lighting. It also doubles for lectures or demonstrations, and has two wheel chair accessible seating areas. The cinema is located near the meeting rooms and the theatre, and can be used for multiple meetings. In-cabin movies are also scheduled throughout the day. As on all modern cruise ship, the spa has a notable size and is light and roomy. Located forward of the wheelhouse, it occupies two decks: the upper one houses an enormous fitness area with treadmills, bikes, a weightlifting area and other machines outside, facing the seas, and a well sized wooden aerobics track inside. Aerobics and yoga classes are scheduled throughout the day. Down one deck is the spa, with a dusted pink Indian decor. There are 12 treatment rooms and a hair salon. The relaxation room forward is excellent, with big flicker seats and splendid views. A new concept is the Thermal Suite, located on the starboard side, in which guests can use a lounge with heated tile recliners, two ice drench/tropical rain showers, a sauna, steam room and an aromatherapy chamber, all done in green tile. A mosaic, called Tropical Garden, made by Sally Anderson, is also located here. 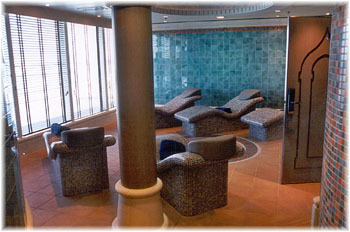 Steiner operates the ship's spa, and there is an outdoor section forward, plenty of lounges for sun seekers. Treatments are expensive, but a good value is the unlimited use of the Thermal suite. 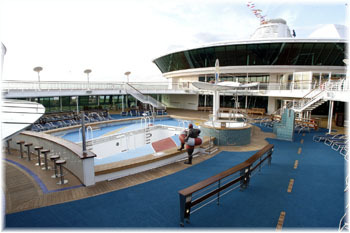 The adjacent Solarium is a further refinement of the concept introduced by RCI in 1995 with the Legend of the Seas. It is covered by a retractable glass roof, and look like a tropical bird sanctuary, with water falls to drown out any noise. Overlooking the pool there are towering tropical plants, and a wooden footbridge feature in front of a Thai temple and two enormous plaster golden elephants. Aft, there is a grey tiled mosaic floor, and comfortable red cushioned lounges are found everywhere. The central heated pool houses more Asian themed sculptures and ends in a Jacuzzi, which has a ceiling like a hut. A bar of tropical atmosphere is located in the port side, plenty of wood works. According to the ship, the theme is Balinese or Indian, but always of a tropical flavour. The circulation between the forward stair block and the outside pool is teak decked, whereas the rest of the floor is tile decked. For outside sports enthusiasts, the sports deck is modelled on a country club and offers a great variety of activities. There is a rock-climbing wall that towers 200 feet above the sea on the back of the funnel, a nine-hole miniature golf course (both free of charge); a basketball, volleyball and mini-soccer half-court; two ping pong tables; shuffleboard; a jogging track; and a golf simulator. The outdoor pool has an asymmetric lay out, with two Jacuzzis located port side under big canvas. It has the same feel as a modern pool, with some teak floor, surrounded with a blue, ocean like plastic made deck and a lot of metal made loungers, with blue cushions. Also, there is a small stage aft for night activities such as live music or mid night buffets. Passengers will not have to fight for deck space, because the pool is surrounded by an upper deck, which also houses the jogging track. It has two pool bars located forward on both decks, which features a counter decorated with maritime flags, and adds to this area a nautical flavour. Also, there is a second counter on the lower bar, opposite the main one, with a wooden top, which also houses a fountain in the aft side, near the pool. A separate kid's pool area, with a large waterslide, is adjacent to the Adventure Ocean children's facility. 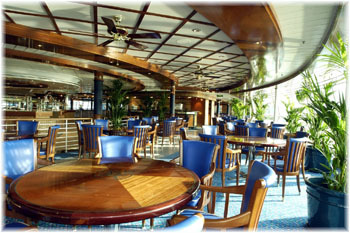 The Windjammer Café on Deck 11 is a self-service restaurant with seating for approximately 400 passengers. The Windjammer is a spacious, free flow lay out with food islands, which help circulations and seems far less massive than it is. I think the design deserves special recognition. It is decorated in nautical blue with a marine look, and nautical memorabilia such as two big yacht models. All carpets are blue, with marble floors in the corridors, and most of the chairs and sofas have blue upholstery. It has floor to ceiling windows both sides, but in some places seems dark. Seating is very comfortable, in leather chairs, and there is abundant indoor and outdoor seating. Windjammer has individual, tastefully presented food stations for individual courses (meat, hot entrees, salads, beverages, hot dogs and burgers, pizza, stir-fry, ice cream, desserts and even condiments). The trays and railings are replaced with marble countertops, and the long lines are gone. There is also an outside section on the aft end, fitted with a canvas that overlooks the stern; and a semi open area called Windjammer Alfresco, with glass windows and a pastel floor, both with wicker shaped furniture and blue cushions. The Seaview Cafe, located a deck higher on the starboard side, works as an extension of Windjammer. A stair joins them. Of course there is a fishing village flavour, and features fast-food menu for lunch and dinner. The views here are excellent and the outside section is protected from the sun thanks to some canvas. Royal Caribbean's "Adventure Ocean" youth programs offer your children their own private facilities and makes these ships an excellent choice for families with children. They are ample and well designed, with outside and inside sections. It houses an Internet café, a games arcade, their own dining room and galley and Fuel nightclub for teens. The counsellors are split in five separate age groups and the parents can leave their children at Adventure Ocean while they take shore excursions. For this purpose, the facilities open 30 minutes ahead of morning shore excursion departures. Otherwise, organized activities are offered from 10 a.m. to 10 p.m., with group babysitting from 10 p.m. to 1 a.m. for a fee. Private babysitting is also offered from 8:00am to 2:00am, provided sitters are available, for children from six months old. By night, the 360-degree views Viking Crown on Deck 13 consist of two spaces: a nightclub and a disco. By day, both serve as observation lounges. On Voyager class, RCI don't place the disco on the highest deck. But on the Radiance class, RCI put back the disco where it belongs: overlooking the pools, as the higher located room on board. The disco has an annular lay out, and has two levels: the zone close the floor to ceiling windows is lower. It features a revolving bar, very futuristic in shape, with a lot of stainless steel and a wood counter with illuminated glass top. The marble made dance track is located in the centre of the room, between the two entrances. The rest of the room has both brown and blue tapestry, and the chairs are mainly red. The adjacent Hollywood Odyssey is low key, with jazz and vocalist acts. It has a terraced lay out, with three levels: the upper houses the bar, located close to the entrance, and the lower the small stage. There are lots of light wood panelling, mixed with blues, and a garnet tapestry. A lot a Hollywood star portraits are found here. The big sofas have also garnet tones, and are very comfortable. I always found this bar full. The lifts lobby on this deck is also beautiful, with a sun tapestry and a sky mirror. The Radiance class ships have 15 cabin categories ranging from 15,4 to 93 square meters, with the majority averaging about 16 square meters. Of the 1,050 cabins on board, 813 (80 %) are outside and 577 of them have private balconies including one Royal Suite, six owner suites, and 17 balcony suites. Also, the ship is provided with 14 cabins for passengers with disabilities. The cabins are very spacious and are specially equipped to meet the requirements of handicapped persons. Eight of these cabins have a private balcony. Inside cabins do measure about 15 sq. meters; but outside cabins range from 16 to 24.6 sq. meters and suites from 56 to 93 square meters. Also, all cabins feature a queen convertible bed, vanity with pull-out desk, colour interactive TV, telephone, a safe, an internet connection, refrigerator/mini-bar (with an additional fee), individual temperature control; and an RCI first, hair dryers. In all cabins, the living area can be separated from the bedroom by a curtain. The design of the balcony cabins in the Radiance class is excellent. For example, the Radiance of the Seas was the first ship to tuck the extra bunk into the ceiling, and includes other touches such as beds with rounded corners and lighted vanity tables with mirrored cabinets, and a retractable board. The wood is darker than other modern cruise ships, and, as a consequence, the atmosphere is more intimate, but also less gay. The lighting is also excellent, and there is more than enough space to move around. I think the Achilles heel is the closet and storage space, and cabin soundproofing. The storage is less than other RCI cruise ships, with shallower cupboards and tighter storage. Also after constantly hearing my neighbours on both sides, I would have liked better soundproofing. But the cabins are very quiet, as the Radiance class are gas turbine vessels. In balcony and standard cabins, bathrooms are tinier, but functional, with a large shower and one medicine cabinet. Tubs are found only in the highest category staterooms. Also, there is even a full-length mirror in standard cabins. I think the best balcony cabins are on the aft end of the ship, overlooking the ocean. Here, you'll get the largest balconies on the ship, measuring 4 meter long x 2.9 meter wide. Another quality detail is the balcony partitions: there are steel walls between balconies instead of the glass partitions common on most new ships which afford no privacy at all. The Royal suite covers approx. 90m_ and has a fully glazed front. A piano, a large bar area and a marble bathroom provide a maximum of comfort. For families, three family suites are provided aft starboard, with a big balcony. Each is provided with two separate bedrooms, a large balcony and a whirlpool. Also, six family cabins, located on the fore end on deck 7 and 8 (without balcony), and 200 cabins which are furnished with an intercommunicating door by which they can be converted to 100 double cabins, are well suited to accommodate families or groups. The passengers are served by 858 officers and crew. The ship is powered by a pod drive and the innovative gas/steam turbine system for extremely low sound and vibration levels. The engine power from the two gas turbines, and singe steam turbine is 59,000kW or 80,240hp and the propulsive power is 40,000kW (two 20,000 kW pod units) or 54,400hp. It can attain a speed of 24 knots. The cruise vessel was built under the survey of the Classification Society Det Norske Veritas to obtain the class notation 1 A 1 "Passenger Ship" ECO, RP, Clean Design, Comfort Class. As an environmentally concerned passenger, I am pleased with the Brilliance's smokeless electric gas and steam turbine engines, which reduces smokestack emissions, and noise and vibration levels.